The aurora borealis is a breathtaking sight that many consider themselves lucky to catch. Today, Marquette-based visual artist Shawn Malone shares her secrets for viewing the Northern Lights in Michigan. The aurora borealis – it amazes, energizes and astounds with no two events ever being the same. 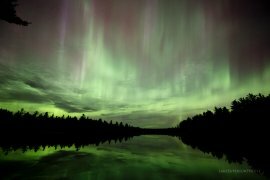 As we cruise through the solar maximum in 2013, the peak of an eleven year cycle of the sun and a time of the greatest auroral activity, there is a heightened opportunity to catch a northern lights show right here in Michigan. 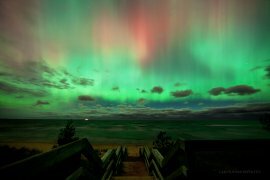 Michigan has a lot of things going for it when it comes to northern lights viewing, the most important being 1). latitude and 2). relatively low light pollution in many areas. Northern Michigan sits in a great location latitude-wise, as the auroral oval dips further south on nights of stronger auroral activity. 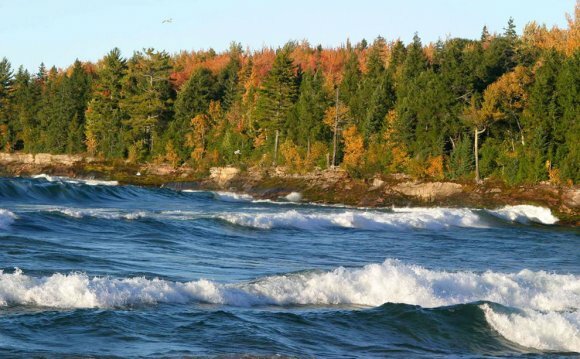 The Upper Peninsula is blessed with hundreds of miles of shoreline along the south shore of Lake Superior, which provides some of the best northern lights viewing in the lower 48 due to the very dark night skies. When looking north over Lake Superior, one can see right down to the horizon and take in a 180 degree unobstructed view of the night sky. Getting to a location without the obstruction of a treeline or hills is important at our latitude, as many times an auroral display will sit very low on the horizon. Having a dark night sky with little light pollution is necessary when looking for the northern lights, as the light of the aurora is equal to the brightness of starlight. People often ask me how I’ve been able to see so many northern lights displays over the years and a lot of it has to do with what I mentioned above. I live in Marquette, Michigan which sits centered on the south shore of Lake Superior, and when looking north there’s nothing but lake for hundreds of miles. Marquette and locations nearby have many areas along the lakeshore still publicly accessible, allowing for the opportunity to view the aurora right from the shoreline. If you’ve never seen the northern lights and want to maximize your opportunity to do so, learn and pay attention to sunspot activity, as that’s what drives the northern lights. Get away from the light domes of the cities and head north on I-75 and get to a dark sky location in Upper Michigan. If you make it as far as the bridge, check out Headlands International Dark Sky Park, two miles west of Mackinaw City. This is a newly designated international dark sky park, one of the few dark sky parks in the country.